A girl loves dogs. She wants to be one. Shot on location in Dawson City and on Manitoulin Island, Canada, DOG=GOD is an experimental, musical, ecstatic ode to dogs and those who both master and worship them. 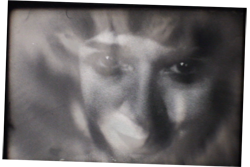 Filmed on Super-8, Dog=God began as an experiment in creative geography. Then, with the yearning melodies of acclaimed Yukon singer/songwriter Kim Beggs laced in, the haunting feeling snaked itself across five provinces and sewed the seams of this gossamer meditation.